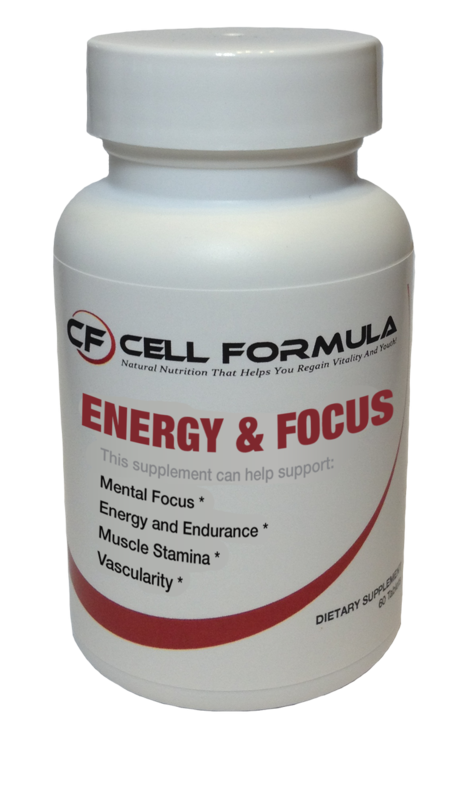 Take 1 Cell Formula Energy And Focus capsule approximately 20 minutes before a workout or athletic event or when you just need energy. For those with a larger body size or tolerance, you may take 2 to 4 capsules to achieve desired results. For maximum performance it is recommended to ingest high quality protein foods or supplements one hour before using the Cell Formula Energy And Focus, and to also ingest high quality protein foods or supplements immediately after a workout or an athletic event. We recommend Cell Formula Lean Protein. We also recommend having a clean healthy diet and utilize all natural supplements in the Cell Formula line of products. Is a non-essential amino acid which is responsible for initiating a few metabolic functions. Arginine is most commonly known for its ability to stimulate human growth hormone production. This biological capability of Arginine is 100% natural and will not raise human growth hormone levels to supra physiological levels (levels greater than the body would naturally produce). However, as we age hormone levels naturally decline and natural stimulation has shown to have positive effects on human anatomy. Additionally, athletes are always in need of more stimulation as their bodies are taxed more than the regular individual. Therefore, natural stimulation will help meet the demand of the athlete’s body. Growth hormone is a great anti-aging hormone that helps induce fat reduction, increase repair and recovery from exercise, and increase muscle mass. Arginine is also a precursor to creatine synthesis. Arginine is one of three amino acids the body uses to make creatine, the other two being methionine and glycine. Another important function of Arginine is its part in detoxifying muscle tissue of ammonia. Arginine converts ammonia to a waste product called urea, which then is excreted by the body. This ammonia detoxification helps reduce soreness. Lastly, Arginine has shown positive effects in stimulating endothelial cells production of nitric oxide. Nitric oxide is a naturally produced gas which induces the blood vessels to dilate (vasodilatation). Vasodilatation increases blood flow. A slight increase of blood flow will enhance the body’s ability to absorb nutrients from the blood into the muscles and increase physical activity. By adding this impressive amino acid to the product, it will help increase physical activity, stimulate natural hormone synthesis, reduce soreness, increase nutrient uptake and enhance overall well being. Is an effective stimulant found in nature. Human bodies recognize and utilize caffeine in several manners which are useful for increasing performance. First, caffeine works in the central nervous system as a stimulator through competitive inhibition. Its mode of function for this particular effect is in the course of its biochemical antagonistic properties. Caffeine is able to cross the blood brain barrier and works as an adenosine receptor antagonist. The molecular structure of caffeine is similar to adenosine and thus binds with adenosine’s receptors on the surface of cells inhibiting adenosine activation which reduces the feeling of fatigue. Interestingly, there are adenosine receptors on fat cells. Caffeine works as a competitive inhibitor on fat cells as well. This means caffeine promotes lipolysis and can prevent fat storage as well as promote fat release. Secondly, caffeine also binds to specific receptors on heart muscle (beta,1 receptors) causing a series of biological events which in turn mimics the effects of epinephrine (to a lesser degree). Caffeine blocks the enzyme that breaks down and leaves more cAMP inside the cells. Due to an increase in cellular cAMP, increased messaging occurs and specific proteins activate the rate of glycolysis which increases the sum of ATP accessible for muscle contraction and relaxation. Lastly, caffeine like epinephrine, will bind with receptors on the lungs (beta,2 receptors) and cause a relaxation of the smooth muscles of the bronchi. This opens up the airways to increase breathing and oxygen supply to muscles. Ultimately, the addition of caffeine will result in an increase of energy, mental alertness, and ability for your body to burn fat. Is an intracellular with important biochemical functions. Potassium is essential in neuron function, osmotic balance between cells and a regular heart rhythm. Potassium is crucial for chemical reactions within cells, stable blood pressure (as its role along with sodium as an electrolyte), skeletal muscle contractions, and sending of nerve impulses. Potassium is also responsible for the transport of nutrients throughout the cell's membranes. However, potassium’s nutrient transport capabilities seem to decrease with age, which constitutes a need for greater potassium intake as one ages. Simply put, potassium is extremely important for athletes, fitness enthusiasts, and normal working individuals. Potassium deficiency can lead to uncomfortable medical conditions. Potassium deficiency symptoms include, muscle weakness, cramping, decreased reflex response, fluctuations of heartbeat, glucose intolerance, low blood pressure, among others. Therefore, in order to avoid these symptoms and to promote optimal athletic ability and maintain overall health, adequate potassium intake must occur. Is an incredibly complex molecule. Vitamin B-12 is a general term used to describe a group of compounds named cobalamins. Cobalamin molecules are comparable to hemoglobin yet, as an alternative, cobalamins contain cobalt not iron. Vitamin B-12 is biologically active in the maintenance, development of neural tissue, and protecting against neurological deterioration. In addition, B-12 is responsible for DNA synthesis with folacin [folic acid], new cell growth, assisting folic acid with red blood cell synthesis and metabolism of folate, carbohydrates, and fats. Plainly, B-12 is a crucial component to an athlete’s program. Deficiency symptoms of B-12 can consist of pernicious anemia, irritability, fatigue, constipation, headache, loss of appetite, and sore tongue. Consuming B-12 daily through supplementation is very important if you wish to optimize your well being. Consuming our Cell Formula Pure Energy with the additional B-12 before you workout may promote increases in energy, physical capacity, and will help optimize your performance. Caution: Because this product contains Caffeine anhydrous, extreme doses may cause nervousness, irritability or insomnia. If you experience these symptoms, lower dosage on next consumption. Warning: Do not use if you are pregnant or nursing. This product may increase blood pressure, if you are currently using blood pressure medication or have high blood pressure it is recommended to always consult with your health care professional before using. Not intended for use by individuals under the age of 18 years. "The Cell Formula Pure Energy is just good clean energy. I highly recommend it. I am very particular on what I put in my body, if it is not natural it is not for me. All of the Cell Formula products have helped me function better as an athlete and as a business women, I work for the Department of Finance here in Canada and my job is tiring and taxing, the better I fuel my body the better I perform." I love this product and have used it for the past 6 years. I have more energy without feeling any nervous gitters. The support staff is marvelous as well.